What are iGCSEs and why can they help bilingual families? iGCSEs are becoming increasingly popular in UK-based bilingual families as a way to gain a language qualification earlier than 16 or as an additional subject outside the school system. Typically bilingual children are more than capable of passing a GCSE examination earlier or in a language not typically offered by schools. iGSCEs (‘International’ GCSEs) can help by allowing subjects to be studied at home instead. 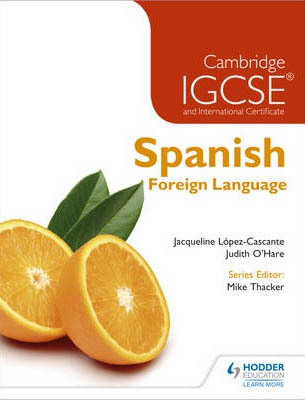 Books tailored to iGCSE language exams are increasingly common. The iGCSE is the world’s most popular international qualification for 14 to 16 year olds and is frequently used in schools overseas with education systems derived from the UK’s or in private international schools used by ex-pats. Like any other GCSE, it is recognised by universities and employers worldwide. The iGSCE is also popular with children that are homeschooled or privately tutored. Cambridge International Examinations is a major provider of iGCSEs. They offer qualifications in over 70 subjects available at Cambridge IGCSE and 30 of these are languages. For many of these languages it is possible to either complete the course as a native speaker or as a foreign language learner, so useful for bilingual children who either fancy a challenge or who simply want to convert their second language into an ‘extra GCSE’ easily by choosing the foreign language option. Although designed for schools, as they are exam-based and do not include coursework, iGCSEs are ideal for home schooling and distance learning. They are ideal for anyone seeking a qualification without having to attend full or part-time classes. As the iGCSE is assessed by examinations it is often considered to be similar in style to the older O-Levels qualification than to the current GCSE in England, and current government Education Minister, Michael Gove has encouraged more mainstream UK schools to offer them on the basis that examinations are more ‘rigourous’ than courses with a large coursework component. Remember, the iGCSE itself is merely an examination and qualification. The student will need to follow the syllabus by themselves, perhaps with the aid of their parents, or work with a tutor. If this is a problem there are an increasing number of online distance learning courses from a variety of providers that use the iGCSE and books to guide you through the topics needed to pass. Are you currently working towards a iGCSE language qualification with your children? Let us know how you’re getting on in the comments.